The reign of Edward VII was only nine years from 1901-1910 and yet the term Edwardian applies to a period much longer than this in furniture styles. Generally associated with the Sheraton Revival of furniture making, a large quantity of furniture of mahogany inlaid with satinwood and boxwood and ebony was made by a number of important firms, notably Edwards and Roberts. Founded in 1845 at 21 Wardour Street, the company occupied a dozen buildings in the same street by the end of the 19th Century. An Edwardian Walnut, Mahogany and Floral Marquetry Partners Kneehole Desk (FS20/1112) that sold for £2,300 at auction in our Autumn 2013 Fine Sale. Another name associated with the Edwardian era is that of James Shoolbred and Company. Originally a department store in the Tottenham Court Road, the company began designing and making high quality furniture in the mid Victorian era and continued until the company ceased operating in the early 1930s. A great many of the pieces of furniture made by Shoolbred and Company are stamped with their manufacture. At a similar time that Shoolbreds were established in the 1820s, so too was the firm of Howard and Sons. The name is still now synonymous with high quality chairs and sofas. Operating from Berners Street in London, they gained a royal warrant in 1901 and operated at this site until 1935 when the company was taken over by decorators Lenygon and Moraut. The name of Howard and Sons continues to this day. 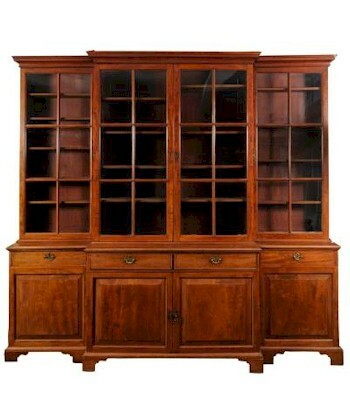 An Edwardian Mahogany Breakfront Library Bookcase (FS20/1113), which realised £950 in October 2013. The Edwardian era of furniture making would not be complete without mentioning the firm Waring and Gillow. 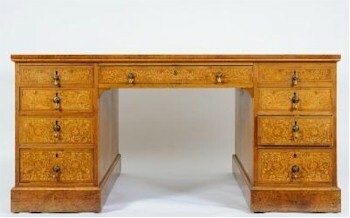 Formed in 1897 by the merger of two companies Gillow of Lancaster and Waring of Liverpool, the company achieved success not only with the sale of high quality furniture for the domestic market, but also the furnishing of hotels and public buildings throughout Europe as well as the outfitting of luxury yachts. The company that Waring and Gillow eventually merged with was Maple and Co, which was founded by John Maple, who had also opened a furniture shop in Tottenham Court Road. His son John Blundell Maple took the business to great heights and by the 1880s Maple and Co was the largest furniture store in the world. It is worth noting that the capital value of the company in 1890 was two million pounds.